Help! My Chariot is Stuck! As expected, Timur Bekmambetov's Ben-Hur (2016) film is different from the 1959 William Wyler film starring Charlton Heston which begs the question: Is that good or bad? Bekmambetov's film is about an hour shorter and that alone makes for a different kind of film; characters and storylines have to be dropped. Anyone going to see Bekmambetov's Ben-Hur and expecting an update of the 1959 classic will be disappointed. If you are going to see a fresh yet faithful take on the 1880 book by Lew Wallace, you will also be disappointed. Low expectations and/or unfamiliarity with the subject will be an advantage for most viewers. 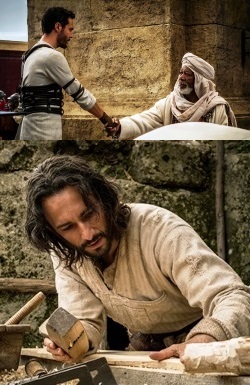 The 2016 version of Ben-Hur tells the fictional story of two men: Judah Ben-Hur (Jack Huston), a wealthy Jewish prince living in Jerusalem in the years leading up to Jesus' crucifixion, and Ben-Hur's adopted Roman brother Messala Severus (Toby Kebbell) who seeks to make a name for himself in the Roman army. As Messala rises in authority and power his loyalty shifts from the family who adopted him to Rome and its army in which he serves. Following a zealot's assassination attempt on Pontius Pilate (Pilou Asbæk), Ben-Hur's family is falsely accused of treason. This results in the destruction of their household and Ben-Hur's imprisonment as a Roman galley slave rowing an oar for the glory of Rome. During a battle he escapes the destruction of the fleet and, motivated by hate, returns to Jerusalem under the patronage of an African merchant Ilderim (Morgan Freeman). Ben-Hur’s mission is to not only find out what happened to his mother (Ayelet Zurer), sister Tirzah (Sofia Black-D'Elia), and his wife Esther (Nazanin Boniadi), but also to exact revenge on Messala for the misfortune he had brought upon the family. His plans for revenge are ultimately thwarted by the life and death of Jesus (Rodrigo Santoro) which is threaded through the film— a life that values love over hate which becomes a force for change in a land oppressed by the Romans and ultimately turns into a wellspring of forgiveness between bitter rivals. • Where as in the 1959 film and the 1880 book Judah Ben-Hur is adopted into the Roman family of Quintus Arrius, in the new film the Ben-Hur family adopts the Roman Messala. Quintus Arrius, the commander of the Roman fleet in which Ben-Hur is chained in slavery, is unceremoniously killed in the sea battle so he can’t take Ben-Hur under his wing and the Roman isn't saved from death by the Jew. Since the adoption theme is switched, Ben-Hur doesn't meet Pontius Pilate in polite Roman society before returning to Jerusalem. Also Ben-Hur doesn't return home as a man with Roman status, privilege, and wealth equal to and/or better than that of his rival Messala. • Another change is Ben-Hur's early marriage to Simonides' (Haluk Bilginer) daughter Esther. In Bekmambetov's film Simonides dies as the Hur family is being falsely arrested and Esther, Ben-Hur's wife, escapes the carnage and ends up with Jesus and His disciples. This eventually pits Ben-Hur's love of his wife, who values mercy and love of neighbour, against his personal desire to seek vengeance against Messala. This should be fertile ground for drama but in the end gets lost in the shuffle. In the earlier film, and in the book, when Ben-Hur returns to Jerusalem Simonides is shown to be a faithful steward of the family’s affairs and the love between Ben-Hur and Esther develops slowly over time. Also in the 1959 film Esther is not a direct follower of Jesus in the line of Mary Magdalene as she is in this new film. When it comes to Jesus there are two major changes in the new film: first, the “Wiseman” Balthazar is absent as is the arrival of the three wisemen at the birth of Christ, which in Christmas-card fashion was piously displayed in the 1959 film. In the new film Jesus is simply a man preaching and living peace in the face of hate and corruption, fitting the stereotype of the good and moral teacher. This downgrades a clear proclamation of Jesus' divinity. Filmgoers are left filling in the blanks as to who this Jesus is which might be a fine approach if the film had provided a definitive answer to the question by the final scene. Primarily, Jesus is shown performing acts of mercy like giving Ben-Hur water as he is dragged off to a life of slavery on a Roman galley. Second, Jesus speaks. Unlike the 1959 film Jesus is very talkative. When first meeting Ben-Hur Jesus says, "love your enemies ... God is love ... He has a path for you," and when giving Ben-Hur the drink of water and Ben-Hur says, "Thank You," Jesus either says to the man, "You do the same," or "You'd do the same." In the third act of Bekmambetov's film when their paths cross again, as was the case in the 1959 film, Ben-Hur returns the favour by giving Jesus a drink of water as He is led to crucifixion. What do we make of Jesus' words to Ben-Hur, "You do the same," or "You'd do the same?" This sounds like the end of the parable of the Good Samaritan in the Gospel of Luke when Jesus asks the question, "Which of these three (priest, Levite, Samaritan), do you think, proved to be a neighbour to the man who fell among the robbers?” [The lawyer who'd asked the initial question “who is my neighbour?” responds], “The one who showed him mercy.” And Jesus said to him, “You go, and do likewise.” The 1880 book and the 1959 film both borrowed from this parable adding to it a clear consideration of the providential hand of God in the life of faithful believers. The new film attempted to take a stab at this same theme but fails to make the providence of God either poignant or plain. Not that it doesn't try. 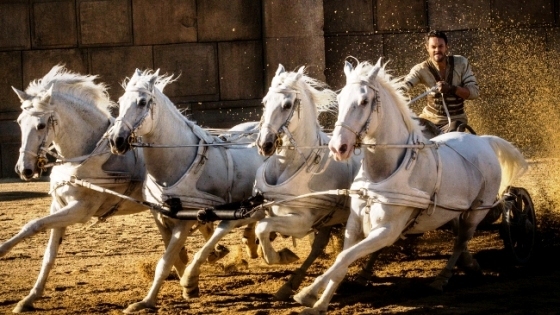 During the chariot race there are flashbacks to Ben-Hur's time as a slave in the Roman galley indicating that his time there was beneficial to his winning the race. But is that chance or the hand of God? The book and the 1959 film make it clear it was the hand of God. In earlier versions of the story Ben-Hur is depicted as moving from being a faithful Jew to being a believer in Jesus as the Christ; not so in Bekmambetov's film where Ben-Hur is an agnostic with a low opinion of religious influence and divinity. When his wife Esther says to him, "If God is righteous, we should do righteous things," Ben-Hur responds, "If there is a God, why does He not do right by the world?" Such a statement makes him an agnostic at best who moves to "faith" but it is not clear what that faith entails or who is the object of that faith. Neither is it made clear that "in Christ [Jesus' crucifixion] God was reconciling the world to Himself." So when it comes to the faith of the film’s main characters, viewers are left with a conclusion substantially more ambiguous than that of the fictional Roman Tribune Clavius (Joseph Fiennes) at the end of the recent sword and sandal film Risen (2016) which was also a fictional tale about a man who had interactions with Jesus. Lastly, Bekmambetov's film has a very happy ending which the film through narration refers to as a miracle. In the 1959 film Ben-Hur's Job-like reversal of fortune was the result of the shed blood of Jesus. Where in this new film the audience sees a brief shot of Christ Jesus’ blood trickling down the cross’ beam and Ben-Hur standing at the foot of the cross, it isn't as clear that it's Jesus' blood that brings Ben-Hur's earthly and spiritual salvation. And since the person of Jesus is downgraded to being a good and moral teacher it isn't clear why His death would play a part in Ben-Hur's reversal of fortune or the forgiveness he finds with his adopted brother Messala. With less time to tell the story the film requires a tighter hold on the reins so that the "chariot" of the plotline doesn’t wander all over the place loosing the race! All these changes—likely made for length—have unintended/intended consequences on the unfolding story. Overall Bekmambetov's Ben-Hur is smaller in scale and scope and, even though it's kind towards the Christian faith, it misses the mark when it comes to a clear presentation of the divinity of Jesus. Assuming the audience already knows this fact is lazy filmmaking. On the other hand, if the film’s focus was solely on loving the neighbour and ultimately loving and forgiving the enemy, then it accomplishes its goal. Bekmambetov who is known for action films like Wanted (2008) and highly stylized genre films like Abraham Lincoln: Vampire Hunter (2012) and Day Watch (2006) and Night Watch (2004) was likely not the right director for this project. Under his direction the film’s dramatic elements don't shine through and the storyline seems to fall between the cracks. Sadly, the spectacle and action in the film, which Bekmambetov should have been able to deliver on, don't live up to the 1959 version with the exception of a superior sea battle sequence. 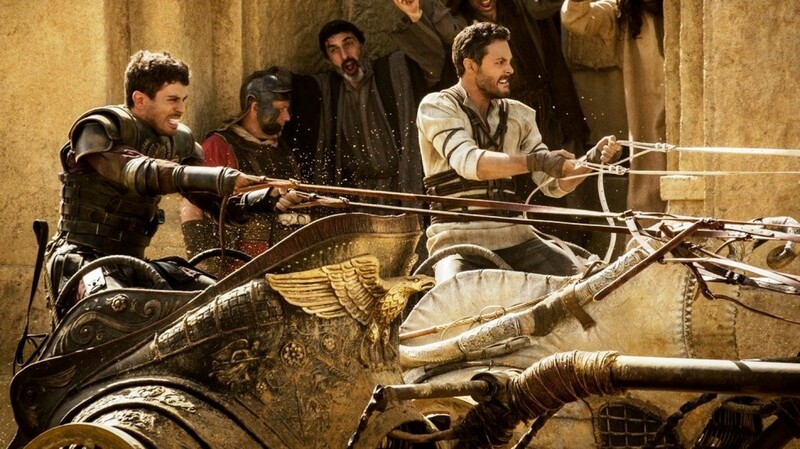 As for the casting, Jack Huston and Toby Kebbell turn in strong performances as Judah Ben-Hur and Messala Severus but they are not well-known, and Morgan Freeman alone can't provide enough Hollywood star-power to draw audiences. Even though Judah Ben-Hur never lived as a real person and Ben-Hur is not a true story, Jesus on the other hand is a real person and His story is true, so when the project lacks lustre, polish and excellence in production the whole endeavour comes across as a missed opportunity in respect to Jesus. Failure to compellingly present the character and story of Judah Ben-Hur isn't as important as it is to rightly present Jesus. On the positive side, in an industry which regularly churns out films hostile to the Christian life and to Christianity in general this new Ben-Hur is not purposely antagonistic towards the Christian faith. Would that it was less of a mess and bolder in its proclamation of Jesus as the Christ.